After Flipkart, Amazon and Snapdeal, it is Google’s turn to try and cash in on the festive season. 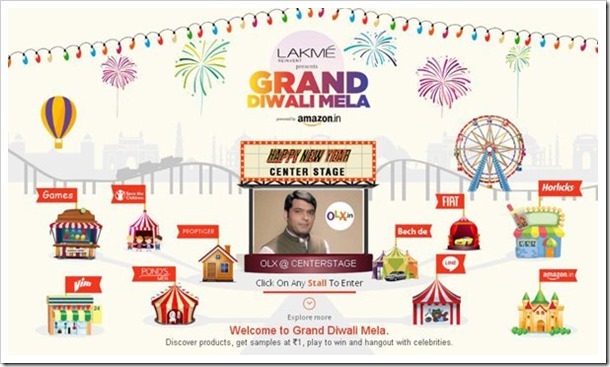 Not wanting to be left behind, the search engine giant has joined hands with GroupM to launch an online shopping platform which they have named the ‘Grand Diwali Mela’. They have set up a special site for the purpose, named the GrandDiwaliMela.com which will be accessible across computers, tablet devices as well as mobile devices. As per this Google, this website will provide all visitors the biggest of both the activities Indian like to indulge in during the festive season, i.e. shopping and entertainment. The online event powered by Amazon started on 1st October and will run till Diwali. GroupM, Google’s partner in this venture, is a leading global media investment management operation which is the parent company to WPP media agencies including Mindshare, Maxus, MEC, MediaCom and Motivator in India. The Google Grand Diwali Mela offers a broad range of products which include consumer durables, electronics, real estate (which includes display layout plans of various buildings from a variety of construction companies which have joined hands with Google for the venture), automobiles (where visitors to the site get detailed info on manufacturers and their product line plus the facilitates booking test drives for vehicles), Godrej home appliances, Godrej security equipment, FMCG products and various games for kids. Besides the huge range of products available on the site, the visitors are also given the option to buy products from websites like Amazon, Snapdeal etc for discounted prices. GroupM has launched aggressive advertising campaigns to create awareness about the online shopping festival across social media, print, radio and TV and they hope to come up with more festive shopping bonanzas for Indian online buyers if this event gets a good response. In our view, Google is too late to jump on and join the bandwagon. The Flipkart sale has fizzled out. Amazon is already running a similar offers. Snapdeal and many other online shopping portals have also offered discounts to customers. In an industry where the early bird catches the worm, Google’s initiative comes as “too little, too late”. The consumers are already flooded with offers. Not a very avid TV watcher, I have seen the Snapdeal ads running for the last couple of weeks already. Regular watchers, I am sure, must be aware of many more bigger and better offers. The consumer confidence in these online shopping extravaganzas has been severely eroded after the Flipkart debacle. The news of ED serving them a notice and the possibility of a huge fine being levied on them has left consumers has not helped either. Whether Goddess Lakshmi will smile and shower her blessings on this not-so-novel idea depends on how well Google pitches itself in the market in the coming ten days.